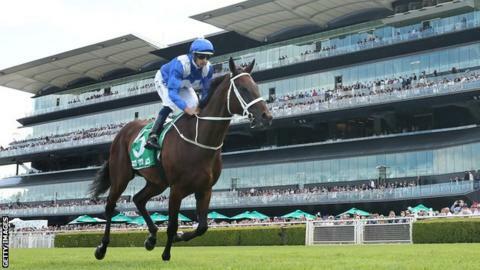 Australian racehorse Winx is aiming for one final record-setting win before retiring on Saturday. Victory at Royal Randwick in Sydney would be the horse’s 33rd consecutive win and a third successive Queen Elizabeth stakes. Winx’s career also includes a world record 24 Group One race wins – the highest level of thoroughbred racing. “Win, lose or draw, I’m so proud of this beautiful horse,” co-owner Debbie Kepitis said. Her bloodline may result in her foals fetching up to more than £550,000 each – earlier this week the mare’s niece sold for £410,000. In the saddle on Saturday and hoping to add to Winx’s tally will be her long-term jockey Hugh Bowman. “I’m sure she’ll perform at the level we’ve become accustomed to seeing from her. I don’t think that deeply into it. As long as we win I don’t care how far we win by,” he said. “It’s been an amazing ride for a lot of people,” trainer Chris Waller said. ← Previous Story Grand National 2019: Full result, finishers and fallers – where did your horse finish?